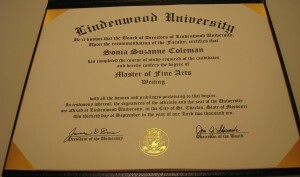 Sonia Graduated with Master’s Degree! Although I finished my final master’s project some time ago (a 130 page project! ), it took me a bit longer to officially graduate and even longer to actually go and pick up my diploma! I know hold a Master of Fine Arts in Writing. Here is my diploma in all its glory! Digital Marketing Strategy: Ride the Groundswell or Crash and Burn? I Won First, Second, and HM in the 2009 National NFPW Communications Contest! Creating strategy for health association website and reorganizing content for greatest impact. Helping coordinate and manage media relations for a press conference involving the mayor, city economic leaders, and our client. Developing marketing materials and website copy for a new service offering for a transportation company. Interviewing families, writing the script, and producing a video on Foster Parenting. Editing research case studies on sustainability and green initiatives. Layout and design for research white papers. Developing an identity and ad for a kitchen and bath company. Writing and designing a brochure to teachers about free agriculture programs through a national association. Creating a website (writing & design) for an eyeglass and eye care store (with sister company NeuConcept Productions). Writing a magazine company profile on electrical manufacturer of cable trays, Cablofil. Researching & writing a magazine feature article on e-commerce standards. Bobby Sue Dill on I Won First, Second, and HM in the 2009 National NFPW Communications Contest!